Great post, Erin! I like the cleaning playlist idea. These posts address the biggest frustration in my marriage. I am constantly purging clutter, but my husband hoards things with fear that he might need them later. I’d appreciate any advice for how to convince your partner to take a more realistic view of how much they will use things, and how much redundancy is necessary. An example: one pair of backup eyeglasses is ok (so you own 2 eyeglasses max at any time), but keeping your last 5 pairs is unnecessary…right? Sadly, I think that hoarding is so inherent to some peoples’ nature that it could only be changed with intense counselling. The desire to acquire resources for survival is hard-wired into our DNA. Thank you for the post Erin! I need to read and re-read this, as seeing that I try to purge and organize but my boyfriend is a hoarder. But I know he’s expressed the desire to be organized or to have the house organized and just doesn’t do it. And I get frustrated that everytime I try to clean and organize things never seem to stay that way. So I’ll try to be more patient and nag a lot less. Because I can say that I nag quite a bit, but I just don’t know how to get across to him that I’m tired of his dirty laundry scattered on the floor and all the other habits he has. Angela, I know exactly what you are talking about. Is it really necessary to keep 5 pairs of white shoes? I’m a woman and I don’t even own 5 pairs of white shoes. @Michael and @Cynthia — There is a difference between someone who is messy or chronically disorganized and someone who has the diagnosed condition of a hoarder. Hoarding is a disorder that requires the care of a licensed medical professional, and is usually a trait found in people with OCD. Being messy or chronically disorganized is not a medical condition and these habits can be changed. So, someone who throws his/her clothes on the floor before bed is probably disorganized or messy. This behavior can easily be changed by having the person get ready for bed at least an hour before bedtime when they still have energy, the lights are on, and the hamper can be seen. Also, wherever the clothes are usually found on the floor is a great location for a hamper. Keep multiple hampers in the bedroom and bathroom so that it’s more likely the person will properly aim. And, keep the hampers small and empty them every day or every other day so that they always look inviting for dirty clothes. If the hamper is overflowing, there will be clothes on the floor. This post came just at the right time. My house is a mess, and my loved one isn’t quite as bothered by it as I am. Bless his heart. lol. I think it’s important to be realistic and willing to compromise. Some of us who tend towards museum-level neatness need to loosen up and not be bothered by magazines scattered across the coffee table and the occasional jacket hung on the back of a chair. I think there’s a basic level of cleanliness and neatness that it’s fair to expect from anyone in a shared space (a kitchen that won’t attract pests, being able to move around easily without tripping over clutter on the floor, laundry done often enough so the piles don’t smell, etc. ), but above that it’s not always and entirely about the messier person learning to conform to the neater person’s standards. The advice in the post is all great, but it’s also important to take a step back and make sure that your expectations are reasonable. I say this as the neater partner of a semi-messy but not disastrously messy person. It’s been important for me to realize that the neater person is not always right, and that I can just let it go sometimes. I have a similar concern, but it’s between myself and my parents. I’ve moved back in with them to complete law school (saving money!) and find that their lifestyle simply prevents me from having a “safe” space to work. They believe in the classic American materialist life — the more you have, the “better” a person you are — and I’m ADD and easily distracted. Frankly, it’s in the way of my studies. There won’t be any “fixing” them, of course, and so (because I’m an only child, and so are both of them) I look forward to a significant five-year hiatus in my life, at some point in the future, when I simply abandon all of my life in order to clean up after them. I’ll have to “get rid of” the entire collected heirlooms of two sides of the family, three homes that are packed with stuff stuff stuff. Some of it, of course, I’ll value and keep — great-great-grandma’s quilts, etc. — but most of it is not interesting to me. Though it might gain income from an E-Bay sale, the grief of having to deal with it, item by item, won’t likely be worth the time it takes. Thanks, mom and dad, for stealing a portion of my life because of your shallow materism! Well, that’s the trade-off I make. That, or never talk to them again. We live with the hand nature dealt us. erm … *materism* — MATERIALISM was the word I meant, obviously. Ever think YOU may be stealing a portion of your mom and dads life by moving back in with them? Erin, I was with you until you used the “lazy” word. 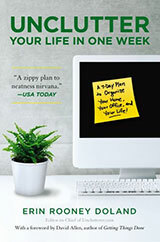 I believe that most chronically disorganized people are not simply lazy. There is usually an underlying condition or source of the problem — and I appreciate your follow-up in the comments section explaining that hoarding is a specific, extreme condition requiring treatment by a licensed professional. 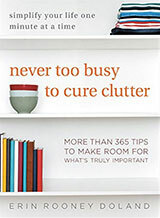 But chronically disorganized people may suffer from ADD; others may need psychological help to discover the many other possible reasons that they cling to their clutter, whether the problem began with childhood conditioning or developed later in life due to depression or a triggering event like the death of a parent or spouse. I’m certain there are some lazy folks out there who just need a nudge (or shove) in the right direction, along with learning some organizing skills, in order to get uncluttered. But I just cringe a bit when that “lazy” word is used casually as if laziness were the most common barrier between being cluttered and being neat. This blog usually demonstrates great awareness about the problems of dealing with clutter, so I just had to call this to your attention. Thanks! @Cynthia — I agree that most people who have problems with disorganization are not lazy. My first point in this article clearly acknowledges that. However, saying that laziness is NEVER a cause is inaccurate. Also, someone can be chronically disorganized and not have ADHD. I am a prime example of someone who used to fall into that category. Conversely, just because a person has ADHD doesn’t mean that he or she will have symptoms of chronic disorganization. Even if someone has ADHD and is chronically disorganized, he or she can learn how to be organized. I have worked with numerous people who have ADHD and have seen them learn organizing skills and transform their lives. It’s okay to talk about laziness as a component to clutter, same as it is okay to talk about ADHD and materialism and out-dated cultural practices and all the many different causes. Sometimes people are lazy. Sometimes we come home from work, are exhausted, and choose to sit on the couch and be lazy instead of taking on a bunch of organizing tasks. I do it, and I bet that you have done it, too. I also know that some people I have worked with who have ADHD have put their feet up and shut out the world for a while and delayed organizing tasks. Laziness isn’t the only cause of disorder, but, like I said earlier, that doesn’t mean it is NEVER a cause. It’s okay to talk about laziness, and we’ll continue to talk about it on Unclutterer. @Sky: I’m willing to bet Cliff asked their permission before moving back in. @Cliff: If you think one or both of your parents are serious hoarders, there are groups for the children of hoarders that might help you deal with it now as well as later. There’s always trade-offs when one saves money by moving back in with your parents, and the overstimulation of your ADD may be something that you have to decide the value of – if you can’t work, and you don’t do well in school, are you saving as much money as you think? Curious, the ‘lazy’ word. I am quite tidy and organized. I tell people it is because I AM VERY LAZY. I hate looking for things. Have you ever watched a chronically disorganized heavily cluttered person look for something? My goodness, the energy, hours spent flinging things around, calories burned. Other words can be used with a disorganized person like: wouldn’t you rather relax and not have to hunt for stuff? Wouldn’t you like to be lazy? Excellent post Erin! I think one thing that many of us unclutterers tend to forget, though, is that some people actually like it better with clutter. They don’t like cleaning or having to remember to put things away, and don’t see what all the fuss is about. They don’t see inherent advantages in uncluttered homes, and they want to be left alone. And I think that’s OK. Not everyone is the same. The problem, of course, is how to deal with it if you live with that person. I think Erin’s strategies in this post are great — the conversation is especially important, as is creating responsibility lists. But sometimes you have to split up a room or a house and say — this is my uncluttered side, and you can have your side or rooms the way you like it. Then work out a livable solution for common areas such as the kitchen. It’s not ideal for the unclutterers among us, but not everyone wants to change, and we have to live with that. My husband was always a messy person because he never learned that there was any other way to live. His dad is a “collector”. Last count 4582 books, videos and dvd’s. Nothing is organized in any way. His mom and step mom both have an emotional attachment to their stuff. Long story short my husband and I have worked on learning housekeeping together. He has found that it is much easier to live in an organized house with less stuff than in a messy house. We split chores up. Our next big project…the kitchen because I have 2 of every gadget and the garage the place where the stuff we weren’t ready to let go last year of got stored. Our long term goal only what we love and use. I didn’t mean to offend you…. I am extremely neat and clean too, my parents were not and I had to sort through all their stuff when they passed on. Not an easy task but brought back many good memories. Your parents are kind enough to have you live with them, enjoy your time there and maybe you can help them declutter?? It’s funny, when I told people I was going to become a Professional Organizer my family and former roommates laughed. I was the same – the worst at staying tidy or at following through on projects to completion. I have an organized mind but it wasn’t always easy to follow through. I especially like the point that says don’t overestimate what you contribute. The Happiness Project has a great article on this. I’m the messy one in my relationships, major issue in my first marriage and now a definite sticking point in my current relationship. However, I don’t want to be like this. Even worse is that I’m not working at the moment and my BF is paying my rent for me so I feel even worse about my lack of cleanliness. What I have recognised lately is that I get overwhelmed by it all – it starts small, such as leaving out the printer because I know I’ll need it tomorrow but then bringing out something else, or leaving the dishes until later because guests are here etc Next thing I know the place is a dump and I don’t know where to start. Another thing I’ve recognised is that when the place is clean I manage to keep it that way for about a 4 days before it goes back downhill. So this time around I’m doing a few tricks to help me out – I’m doing 20 mins of cleaning every morning between breakfast and lunch. I’m setting the oven timer and starting. 20 mins isn’t much and I can see results. I’m also committing to telling my BF the moment that I start to feel overwhelmed by things so that he can help me get back on top of it all. And he’s telling me that I’ve done a good job when I’ve cleaned stuff up. I’m not expecting miracles, just hoping to stretch my natural clean time from 4 days to 7 at the moment. Thanks for the article. I appreciate the sentiment and your personal experience. My situation is a little different. My husband doesn’t feel overwhelmed or stressed by his clutter. He thrives in it. I have tried many of the things suggested like having a conversation, using gentle reminders. But, he also feels very negative to planning, lists, reviewing what we have agreed before, etc. So what else is there? @Frances — Can you take Leo’s advice and choose different areas of the house to have different standards? I have a friend whose husband makes a complete mess of his office and garage/workshop, but commits to keeping common areas of the house tidy. If you can’t find middle ground, consider sitting down with a therapist or mediator. Having an unbiased third party listen in and provide advice often can relieve stress and make the negotiating less emotional. Also, if you have made previous decisions together about the state of the house and one or both of you are not respecting those decisions, then talking to a therapist can help with those lack of respect issues in your relationship, too. I’m still a fairly clutter-ful person, but I find myself tidying things nowadays when I need to do something. The goal is not so much to tidy, but to _make space_ so that I can get it done with a minimum amount of stress. So, I’ll do the dishes while I’m waiting for water to boil for pasta, or clear off my desk when I’m starting a new project. Also, I’ve grudgingly learned from my mum that it’s an excellent way to find things – you put things away, remove them from consideration, and hence avoid running around in circles (of course, there are also plenty kinds of clutterbug for whom a neat environment makes it harder to find what one is looking for). In short, my suggestion is to point out the times when a bit of tidying would simplify some task or problem. It doesn’t really happen on a schedule, which may be still be annoying for some, but could help alleviate some of your frustration. If you don’t mind the heavy gaming nerd vibe, my husband and I found http://www.chorewars.com to be a great way to measure who was actually doing what around the house. So to change someone into an unclutterer, we must first make them realize how exactly it benefits them. I’ve been the messy person in my family for a long time. I don’t know how I started out, but at some point messy became comforting to me. I liked it. The more my family and other people would nag and yell, the more I collected and the more I hid behind my mess. Deep down I very much liked organisation but I just couldn’t get from that feeling to the actual doing. So they nagged and yelled. And told me ‘ah well, you’re just messy’ a lot. And that became my identity. When I got older and started to find my own identity I learned that I did not like messy, but I simply did not know how to get from messy to organised and nobody had showed me a way (that worked for *me*). I decided to teach myself, and now, about 8 years later I’m starting to get the hang of it. I’ve started to feel good about *my* ideas how to organise and deal with stuff. Sure I still have messes but at least I feel I can handle it. It’s just such a shame when the messy person gets nagged and yelled at. They will not ‘do as you tell them’ if you can’t respet them. If you can’t respect and accept them as a person including the fact that they are messy, you cannot help them, you cannot inspire them. Don’t give them the feeling they’re not good enough, you only hurt them. Glad I found this blog. Please bear with my post. I need to vent. I am the only neat person in a house full of unreal/untidy folks! I’m a relatively neat person. I was raised to pick up after myself: fold the laundry and put it away, don’t let the bathroom turn into a ‘science-project,’ if the floor is gritty, sweep it, and try not to go to bed leaving an overly messy kitchen; you know…the general neat stuff. As a kid, I was allowed to goof-off, but NOT until all my chores were done. I tried to raise my kids the same way. I do the housework much of the time. If I don’t do it, NO ONE will. I’ve yet to see my daughter or hubby pick up a broom, load a dish into dishwasher, put away laundry, dust, etc. Chores are assigned to the teens, who do very incomplete jobs. They never wipe up their sticky spills from the counters or floors, litter box stinks to high heaven, house smells doggy (worse when it rains), one of the dogs’ shedding is out of control(enough daily dog hair on the hardwood floors to create another dog), the floors in the boys’ and grownups’ rooms(including the spacious walk-in closets) are literally knee-deep in clothes(both clean & dirty), shoes, books, toys. Mail and other papers overflows onto the kitchen counters and you have to find a space to cook (even though there is a mail center built into the kitchen). Dog #2 was just acquired, is not housebroken and no one is making the effort. The boys’ bedrooms literally reeks of feet and dirty clothes. When I’m not working my PT job, I often get the youngest ready for school, but can rarely find her clothes because they are usually lost in the knee-deep laundry in her parents’ room. She’s allowed to play and ‘live’ in every single area of this 6000 sq. foot home. Yes it’s a 6000sq ft 800K, McMansion, 6 bedr/4 1/2 bath, complete with chef’s kitchen, in a guarded-gated/golf club community where many of the homes are showplaces inside. My family isn’t the least bit embarrassed. Well, maybe they are, because they rarely have guests, unless of course, I’ve gone on a rampage and cleaned up, making the boys help out. So far, I manage to keep the common areas fairly neat and enforce the kids to keep it neat (cause I can’t stand mess), but their bedrooms are out of control and their bathrooms look like cesspools. Brown stains, hair, dirt, etc. on the toilets and floors. The parents, however, do not contribute to keeping the common areas neat. Dad’s a gourmet-chef-of-sorts but his culinary exploits leave mountains of dirty pots, pans, utensils, and refuse for someone else to clean. To avoid an argument(it’s their house), I simply pick up their messes. They are always grateful for my help but a month later, the knee-deep clothes and trash will reappear, including the empty toilet paper rolls coving the water-closet floor and overflowing wastebaskets. LOL! Would you believe that they recently spent 2grand on a bells&whistles front-loading washer/dryer? And my daughter expresses the desire of owning a more regal-looking 12000 sq ft home. More space for more mess. LOL! BTW, my daughter refuses to part with her kids baby clothes and school papers. I packed them away for her. Three 6cu ft boxes of papers, and 10 huge storage boxes of clothes, many of them worn with holes. this home will ever change. In the meantime, I’m looking for a full-time job to supp. my retirement check so I can move out and wallow in my own neatness. The hilarious, ironic part about our differences is that they don’t want me to move out. They occasionally shower me with presents(new computer, new mattress for my bed, etc) to get me to stay. LOL! Once after returning from an out of town trip, they actually made an attempt to clean the house to make me happy. Well the boys confessed that they were forced to do it. LOL! Just wondering about my family, though. Are they hoarders, clutterers, untidy, messy, or just plain lazy slobs? ((((sigh))) I love them still. I need help with my messy husband. Today I wanted to put up the Christmas tree and he said he does not know where the stand is. Well, the lights and new ornaments from last year are with the stand. I have three boxes of decorations that I stored and when I opened the closet to retrieve them, I could not even get inside for all his junk! I spend three house this morning organizing the closet and it has the same amount of stuff in there as when I started, only you can get inside and nothing will fall on you and you can see what is in there. I have been trying to get him to change. We just moved into a very large home and he has 5 closets all partially full of either junk or clothes, a 2 car drive under garage full to the brim with messiness, and a SEVEN car detached garage that is trashed except for the bay where I pull my car in. I thought lack of room was the problem but now that we have more than enough, the mess is expanding. Please help me, our marriage is ready to take a dive if something does not change soon. I cannot think because of the clutter, he looses things, he buys duplicate items and he will not recognize that there is something amiss. Yes, but. I’m not the neatest person in the world but I was raised by a man who can tell you the physical location of every tool, item and whatnot he owns. I learned a lot of valuable things from him, like keeping things in their “home” and returning them to their “proper home” as a child. Me being “not the neatest” has mostly to do with time – 2 jobs will do that to a person. However, I’ve been living with my fiance now for a bit and he’s got very very bad ADHD. Our home is great – in the public areas. Everything is clean and put away and quite nice (this includes the kitchen). But his office and our bedroom is a nightmare. I cannot clean his office (home based business for the last 15 or so years for him) and attempting to help him leads to frustration for him. He sees the problem but focusing on thinking it all through is literally painful for him. He didn’t used to see the problem and how it impacted his ability to get his actual work done. He does now, which is a huge step forward, but. There is that BUT that keeps sneaking back in there. We seem stuck at this point – lots of improvement, but. It wouldn’t be so difficult but the exit from our bedroom goes through the center of his office for me to get downstairs to the bathroom/kitchen/etc.. You see how the but sneaks back into the equation. Could you write up a specific bit helping partners of ADD/ADHD sufferers help them focus (not painfully) on getting a new system in place. I do see it as changing our systems that are currently in place. Thanks! for grannyshoes- suggest your daughter get some Roombas, a friend of mine’s daughter has one just to keep the pet hair down a little. also they make self cleaning cat litter boxes. granted someone needs to clean these out so, they need to get some kind of cleaning service. You have been doing too much. That large of a house and number of people require outside services to maintain even if people are not cluterers. The difficult part of living with a messy person is there messes spill over into your life. You want to sit down, you have to move there stuff, you want to prepare a meal, you have to wash the counters first for the sake of sanitation, you want to take a bath or shower, you have to put their wet towels in the hamper. And the kids see this and start doing this stuff. You ask the almost adult children to wash the pan they use, they say they will do it, and three days later you find yourself washing the pan. Cleaning is a curtesy issue as well as a sanitation issue. Week old jelly on the countertop gets transferred to your shirt, the plate you sit on it etc. My family doesn’t get it. The reason one cleans is not for the other person but because it makes life easier for yourself. I make a meal/snack, I wash the dishes and counters. They make a meal/snack. Then I come along and have to wash the counters before I can make a meal/snack and wash the counters again which I do as a curtsey for me if I end up in the kitchen again before them. This is only one small problem, there are many others. And it is so limitiing living in other people’s messes, I can’t spread out a project to work on it, because I have to pick up their random messes to have a work space and by the time I do that I will have wasted enough time doing their cleanup that I don’t feel like working on my project, so I don’t do anything. I feel trapped in their messes. What would take them a few seconds or minutes to do as they go along adds up to a few hours of my time. I don’t do that to them, I do things as I go along. I will even wash a pan before I sit down to eat. If the food gets a little cool doing this there is always the microwave. There are days I get mad and say I could make better messes then you. I think I will smear the counter with peanutbutter and toss garbage on the floor. If your going to make a mess why not be more conscious about it. Toss the spaghetti, toss a little across the room. Sounds crazy I know. But their messes drive me crazy. I don’t like having to live in the discomfort of their messes and of course I get accused of not cleaning the house. Well the truth is I don’t work on it like I use to becaue they should all be helping out instead of making work for me to do. I would toss stuff out yet they (esp. dh) would have a fit if I tossed something out which they need. Right now I work part-time right during the best cleaning times (no one is home hours) and I am hoping I find something full-time or my job is made full-time because I am going to hire someone to come in to vacuum, wash the floors and dust. And maybe clean the bathroom. It’s enough to take care of oneself neatly but having to do the cleaning for five capable people,as if I am each their shadow, is self defeating, frustrating and impossible, because their messing doesn’t stop it is continual which is why cleaning up after them is like shoveling into the wind. Thanks for the opportunity to rant a bit. They all have good qualities but neat wise they take after my hubby who is a good man in many ways, yet in someways he is blind and he can’t see that I feel condemn to live in his chaos rather then in peace and tranquility which comes from being neat and uncluttered. Chaos affects me physically and mentally, it makes me feel like I don’t exist, yet trying to clean or fix it doesn’t work because it’s like living inside a tornado or a donation box or dumpster. Things are constantly tossed in in disarray. I lost myself because of this. I am depressed and often can’t manage the small stuff so I ignore. Recently it affected me at work I found myself ignoring things which had to be done but I couldn’t concentrate on and now I have some extra work and explaining to do because I let things go at work like I do at home. This is not who I am except because of living with my dh. I thinks it’s time for me to go back to counseling to see if I can get my focus back and figure out how to cope with the chaos other’s create in my life. Imagine if the grocery or departments store were run and disordered by messy people? Yucko! What a disaster life would be. Good suggestions but like others have said it’s not so simple. Great example at my house. DH will “clean” the kitchen after dinner. He thinks that means wash the pans. No wiping stove or counter, wipe down sink or run disposal. Doesn’t put spices or condiments away. He just doesn’t see the clutter. It’s infuriating. We have a discussion, it’s better for one time and then back to his old habits. I pray I don’t get sick or hurt because we would wind up living in a health hazard.